Riddle me this readers…why do so many educators consider comic books second class literature? Comic books are books. The very word “book” is in the title of the genre. Have educators so lost touch with the act of growing readers that students who are reading comics are ashamed of their choices? First, the student was willingly reading. Secondly, reading choices should not be shamed. Ever. Multiple students have expressed shock in my classroom when they discover that comic books are acceptable reading choices. The only caveat is that everyone work to read across multiple genres. 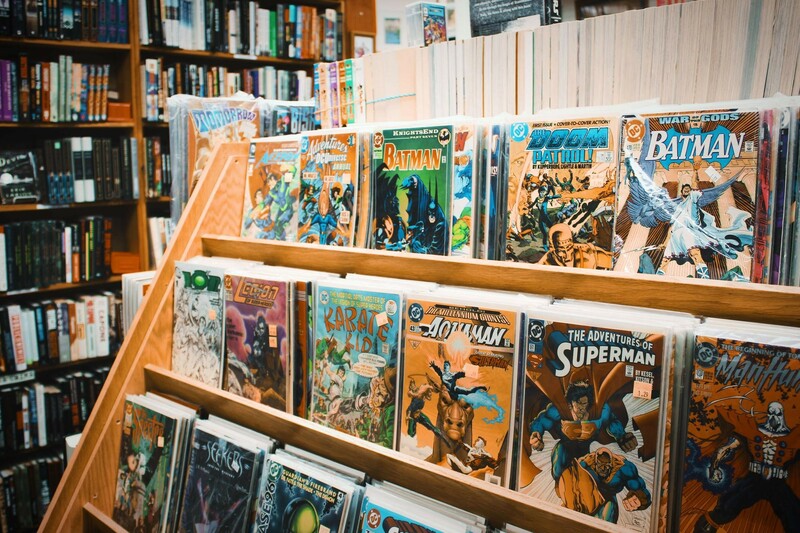 Comic books are a viable contribution to the classroom and can do more for undiscovered readers than access to hundreds of the latest and best chapter books can. What is an undiscovered reader? A person who doesn’t know they love reading and hasn’t found the right text yet. Often, undiscovered readers are marginalized and underrepresented in the books present on our classroom shelves. Comics give undiscovered readers a face, voice and purpose. The benefit of welcoming comic books into classrooms is that you can reach the unreachable. Comic books create readers. This deceptively complex text can answer to all the TEKS and grow your undiscovered reader in to a kid who willingly picks up books. Comic books have involved, complicated plot lines. Some of these plot lines now span generations. Writers take these plots and continue to rework and expand them into a fabulously relevant and ever evolving, streaming works of fiction. Much like Charles Dickens and his beloved The Pickwick Papers, the plots unfold over a whole of series of books. Readers are perpetually engaged and ready for more. In fact comic book readers can read a seemingly never ending story. There is always more or a spin off or a reboot. The reading never stops! Aside from these fantastic plots, the publishers allow writers to go off on tangents and create alternate universe plot lines or completely start over with a character. This is amazing! A reader can potentially see the same characters in a myriad of situations in which the fundamentals of the character stay the same, but the entire circumstance has changed. Try Thor as a woman. Captain America shedding his shield to become Nomad. Robin morphing into Nightwing. Imagine a character study based on ever evolving and transforming characters. These are dizzying concepts and make for a challenging reading experience. Comics are rigorous reads. Comic books are timely. From their inception, comic books have challenged the status quo and worked to advance social issues. DC had Green Arrow and Green Lantern tackling drug addiction, race and social injustice as early as the 60’s. Many have had LGBTQIA representation. In the 80’s, Captain Marvel was a black woman who lead the Avengers. Today comics address the issues we are dealing with as a society. They are socially relevant. Imagine the engagement to be had if you were to pair a comic book with a thematically linked nonfiction text. Minds would be blown and engagement would be off the charts. Comics also have connective powers of a shared societal cannon. Our culture is filled with allusions to character backstories and struggles. A common reference point that the majority can understand and relate to thanks to highly powerful and well marketed movie franchises. Connections can be made with minimal effort. Comics help connect, engage and inform. They need a place on our classroom shelves because these books can forever change an undiscovered reader’s relationship with literature. As an avid comic book reader as a kid and a teen, I have not allowed comics in my class library. I believe they limit students like they did me, someone who only started reading books for pleasure in his 30’s. Comics taught me NOT to visualize – the pictures did that for me. And they restrict readers from developing stamina – I was too impatient with story to ever commit to a BOOK. We are now living in the Golden Age of YA Literature. Comics have their place, but like movies, in ADDITION TO and not INSTEAD OF a great book. Comics are not “Gateways” to novels. I love this post. I often have to defend comics as a legitimate text in the classroom. You are speaking my language, as an adult of a certain age, thankfully my parents were evolved enough to allow and encourage my brothers and I to read comic books. We also read many other things, newspapers, magazines, books of interest to us. . . .and today we are all STILL huge readers of all types of materials. . . .people need to expand their understanding of READING. I now work in a library and it makes my skin crawl when parents turn up their noses at comics/graphic novels. . . .I want to ask if they have read a “Graphic Novel”? There are so many exceptional authors and artists producing incredible work. I could go on and on . . . but I think you get my point. . . .
Love it, I feel the same about comic books. If they start reading they will continue to read and they continue to grow in their reading skills.